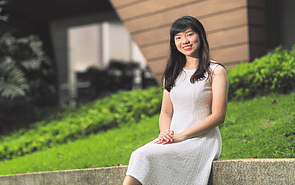 For National University of Singapore (NUS) Merit Scholarship recipient Chen Xinyu, 20, a tertiary education is about breaking out of one’s comfort zone and forging relationships with others. Ms Chen, who is concurrently pursuing a Bachelor of Business Administration, as well as a Master of Science in Management degree, will graduate in 2022. While her parents initially wanted her to forge a medical career like her father, who is the scientific director and chief embryologist of a local IVF centre, the Hwa Chong Institution graduate did not have any interest in reading medicine. Instead, she has an interest in business, which was piqued by part-time stints as a sales associate for luxury brands Chanel and Chloé during her secondary school and junior college years. The eldest of four children, she applied for and was offered several scholarships but decided to accept the one from NUS in April last year, as its vibrant campus life appealed to her. “I attended the open houses of various universities, and had the most enjoyable experience at NUS. I felt very welcome when interacting with the friendly students and professors, and fell in love with University Town at first sight,” says Ms Chen. University Town (also known as UTown) is NUS’ educational hub, complete with residential and retail spaces, teaching facilities and study clusters. It is linked to the main campus via a vehicle and pedestrian bridge. The NUS Merit Scholarship covers her tuition fees, and includes an annual living allowance of $6,000 and a one-time computer allowance of $2,000. It also guarantees Ms Chen a one-semester Student Exchange Programme (SEP) with one of NUS’ overseas partner universities, as well as on-campus accommodation for the first two years of her undergraduate studies. So far, she has taken modules on economics, data analytics, leadership and organisational behaviour. She finds them interesting and challenging, and quite a departure from what she learnt in junior college and secondary school. She also juggles multiple projects, participates in group-based assignments, and makes it a point to hone her presentation skills. What has made the NUS experience truly special for Ms Chen is the community spirit at Tembusu residential college. Her college house — comprising a tight-knit community of residents from Tembusu — offers a haven from the rigours and challenges of academic life. The scholar is also active in the NUS Students’ Business (Bizad) Club. During last year’s orientation, she was part of the Business School team that won the Rag Gold for best performance, as well as Best Float and Best Costumes awards. “I had a lot of fun during orientation, so I wanted to give back to the Business School community in some way and continue to inspire freshmen with the fun and lively culture at the School,” says Ms Chen, who was subsequently elected general secretary of the club. In this role, she liaises with the Business School administration. She also books venues for club events, takes minutes during meetings and organises club activities. But Ms Chen is careful to not let her residential and extra-curricular activities affect her studies. She ensures she gets adequate rest during the weekend, and puts in extra effort during term breaks to stay on top of her studies.